“I’m looking forward to working together with everyone to get this project completed,” said Weehawken Mayor Richard Turner. • A contract to build Hoboken’s second flood pump to alleviate flooding in western Hoboken is expected to be issued within a few weeks. • The City is finalizing plans for the Southwest Park which will include green infrastructure to reduce flooding, with construction expected to begin later this year. • The City has issued an offer letter and is in negotiations with BASF to acquire a 6 acre property in Northwest Hoboken for a multi-purpose resiliency park, underground parking, and large-scale underground stormwater detention chamber. • The City is in negotiations through the redevelopment process to acquire a one acre property at 7th Street and Jackson Street for park space with stormwater detention. • A bid for construction of the City Hall sustainable stormwater demonstration project, which will include rain gardens and cisterns to hold rainwater, is expected to be issued in the spring. • A community meeting for the First Street streetscape improvements project, which will include rain gardens, will be held on Thursday, January 22 at 7:00pm at the Multi Service Center. The meeting will also focus on a city-wide wayfinding system and branding for the City. The project is funded by an $880,000 post-Sandy grant. • The City’s repaving projects scheduled for the spring, will include the installation of four new rain garden curb extensions. • The City recently installed 64 street trees which help to retain stormwater runoff, with approximately 50 more scheduled for installation in the spring. • The City is completing a post-Sandy disaster recovery plan which will include design guidelines for flood-proofing structures, stormwater management plan, and a hazard mitigation plan. 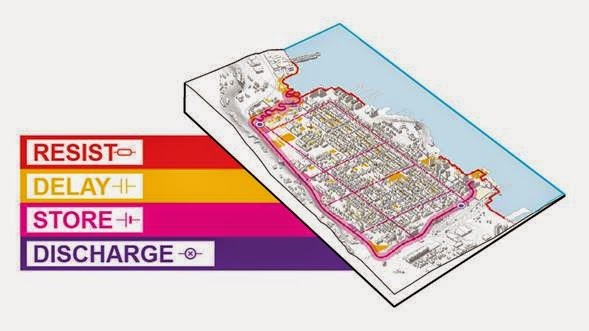 Members of the community are invited to a public outreach meeting tonight, Tuesday, January 20, 2015 regarding the Hudson River (Resist, Delay, Store, Discharge) Rebuild by Design flood resiliency plan. The meeting will take place at 7:00pm at the Hoboken Multi Service Center, located at 124 Grand Street.